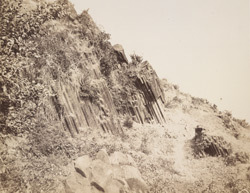 Photograph of slanting basalt columns on a hillside, taken by Charles Scott in the late 1850s. Bombay Island was created in the 19th century by a project that combined seven basaltic islets and is a peninsula of the larger Salsette island to the north. These seven islands were acquired by the Portuguese in the 1534 and came to the British in 1661 as part of the dowry of Catherine of Braganza when she married Charles II of England. The British leased the islands to the East India company who realised the potential of the natural harbour. From 1817 the city was reshaped with large civil engineering projects merging the seven islands into one single mass of around 435 km² by 1845.